Welcome to the Insect Ecology and Communication Lab in the Department of Biological Sciences at Ohio University. Our research focuses on understanding communication pathways in insects (inter- and intra-specific communication) and their environment (plant-insect interactions and foraging). 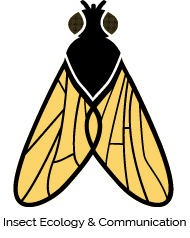 We are interested in using chemical ecology, behavioral ecology and physiology to advance our knowledge of basic insect ecology (foraging, reproduction) in particular for pest management (e.g., bird blow flies, midge flies, mosquitos), forest entomology (e.g., longhorn beetles) and pollination (e.g. native pollinators) applications, and to develop viable monitoring techniques and strategies. To tackle these research avenues, we use a combination of laboratory assays, field experiments and surveys, chemistry and chemical ecology methods (compound identification via mass spectrometry [GC-MS] and electro-antennogram [EAD]) and flashing wing frequency methods. Mitch Duffner (#MidgeManagementOH) and Maddie Sudnick (#VampireMaggots) took 1st and 2nd place at the OHIO University Student Expo on April 11, 2019. CONGRATULATIONS! Students study vampire maggots was published in The Post on March 6, 2019 and written by undergraduate student Jordan Ellis. Summary: Ohio University researchers study parasitic bird blow flies (AKA vampire maggots) in an attempt to identify new management techniques for control. Biologists lure beetles to diversity study in Romania as a featured article in the Ohio University College of Arts and Sciences Forum. Summary: Ohio University researchers use non-lethal techniques to monitor long horned beetles that are considered both pest and an endangered species. We received funding from Columbus Audubon in support of our Avian Parasitic Fly Project (#VampireMaggots). In collaboration with Avian Behavioral and Physiological Ecology Lab, led by Dr. Kelly Williams, this research seeks to identify communication pathways for management of parasitic bird blow flies. Maddie Sudnick wins Provost’s Undergraduate Research Fund (PURF) to support her 2019 project investigating management strategies for the Avian Parasitic Fly (#VampireMaggots). CONGRATULATIONS!! Athens Area Birders features Dr. Bekka Brodie, “In the Eye of a Fly: What is behind the large, specialized eyes of flies? And how do they use them to communicate, find mates, and food?” ODNR meeting room, 6:30pm, 6 November 18. Anna Pasternak presented a poster “Exploring novel ways to control nuisance non-biting midges other than larvicides: polarized light and chemical odors as oviposition attractants” at the 34th Annual Scientific Symposium of the Ohio River Basin Consortium for Research & Education (ORBCRE) and the Ohio River Basin Alliance (ORBA) Conference, Thomas More University. Crestview Hills, KY 17-19 October 2018. We received funding from Intko Supply Ltd. to assist with developing the most attractive wasp trap in Canada and the U.S.! Undergraduate Research Students Claire Rothman and Olivia Amos started preliminary work this fall (2018) at Snowville Creamery! Sustainability Theme at Ohio University features Dr. Bekka Brodie. Understanding and manipulating fly visual cues for earth friendly pest management solutions. 319 Alden Library, Ohio University, at 4:30pm. 25 October 18. Madeline Sudnick, Undergraduate Research Student, wins first place award for her poster, “Nest structure, temperature and blow fly (Protocalliphora) parasitism in nest box breeding birds” at the Ohio Avian Research Conference at Denison University (21 Oct 18). Researchers study midge fly infestation in Ohio wastewater treatment plants as a featured article in Phys.org. Summary: Brodie and Johnson are leading a team of undergraduate researchers in an effort to combat the pest midge flies in wastewater treatment plants. Ayden Wilson, Undergraduate Research Student, wins second place award in sustainability for her poster, “Are flies pollen their weight? Data mining social media for information on fly (Diptera) pollinators” at the Ohio University Student Expo (April 2017).